Wahama libero Bailee Bumgarner receives a serve, during the Lady Falcons’ loss to Miller on Tuesday at Gary Clark Court in Mason, W.Va.
MASON, W.Va. — They didn’t come out with a win, but the Lady Falcons have had a couple of productive days to start the week. 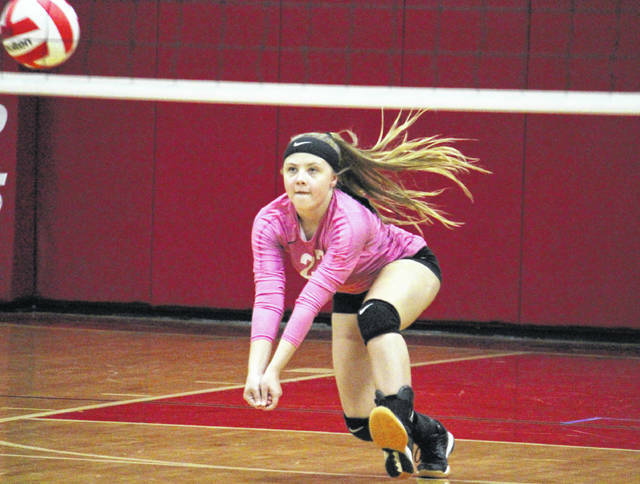 After taking defending league champion Waterford to five games on Tuesday, the Wahama volleyball team fell in five games to Tri-Valley Conference Hocking Division guest Miller on Wednesday at Gary Clark Court in Mason County. On Wednesday, Wahama (1-9, 1-9 TVC Hocking) scored the first three points in the opening game and led by as many as four points, at 7-3. Miller — which improved to 8-3 in the league — took its first lead of the night at 10-9, but WHS immediately regained the advantage at 11-10. The guests tied the game at 11 and again at 12 before taking the lead back at 13-12. Wahama tied the game at 20, but MHS rattled off five straight points to take the 25-20 win. Miller took a 5-3 lead in the second game, but the host Lady Falcons scored the next six points. 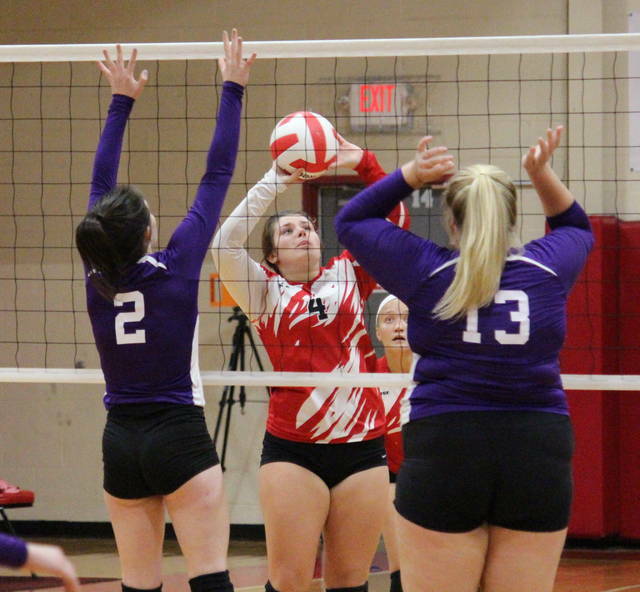 The Purple and Black regained the edge with an 8-1 run, but Wahama scored the next eight points and led the rest of the way to a 25-17 victory, tying the match at 1-1. The guests scored the first eight points of the third game and led by as many as 13 points, at 21-8. Wahama rattled off 11 straight points, cutting the deficit to two, but Miller scored four in a row to take the 25-19 go-ahead victory. WHS charged out to a 7-2 lead in the fourth game, but Miller fought back to take the advantage at 15-14. Wahama was back in front at 17-16, but surrendered the next three points and never led again. Miller closed the match-clinching 25-20 victory with a 9-3 run. Following the setback, Wahama head coach Matt VanMeter acknowledged his team’s errors being a hurdle standing in their way. Wahama finished with a 38.4 side-out percentage, while Miller earned a 40.0 side-out percentage. Wahama had 16 aces and a 91.8 serve percentage, while Miller had a 91.9 serve percentage. Victoria VanMatre led the WHS service attack with 18 points, including seven aces. Harley Roush was next with 14 points and two aces, followed by Alexis Mick with nine points and three aces. Gracie VanMeter finished with eight points and four aces, while Emma Gibbs chipped in with two points. Gibbs led the hosts at the net with 10 kills and four blocks. Mick had four kills in the setback, VanMatre and Roush each had three kills and a block, while Hannah Billups earned a pair of kills. Lexi Layne posted one kill for Wahama, while Gracie VanMeter had one block and a team-best six assists. 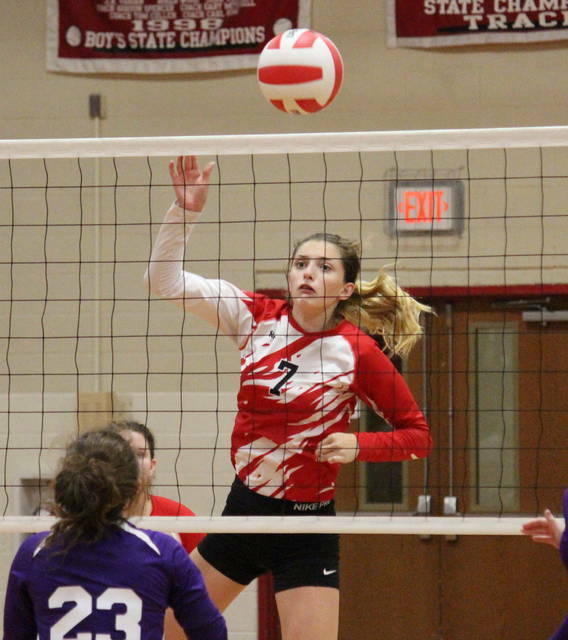 Billups led the Wahama defense with 23 of the team’s 74 digs. The home side wasn’t a full strength on Wednesday, missing a key part of the rotation in Logan Eades. Taylor Hinkle led Miller with 11 points, followed by Josie Perani with eight. Josie Crabtree and Brooke Dillenger had seven points apiece, Brooklyn Wilson added six points, while Alaina Boyden came up with five. Askya McFann, Haille Joseph and Lainey Decore contributed three points apiece to the winning cause. Wilson led MHS at the net with 15 kills and four blocks. Hinkle had 12 kills and four blocks, while Perani had a match-best 44 assists. Against Waterford on Tuesday at Gary Clark Court, Wahama dropped the opening game by a 25-16 count, but battled back to take the second game by a 25-18 count, after jumping out to a 12-4 lead. The Lady Falcons trailed 21-13 in the third game, but ended the game on a 12-2 run to move ahead 2-1 in the match. Waterford never trailed in the fourth game, forcing a deciding game with a 25-13 victory. 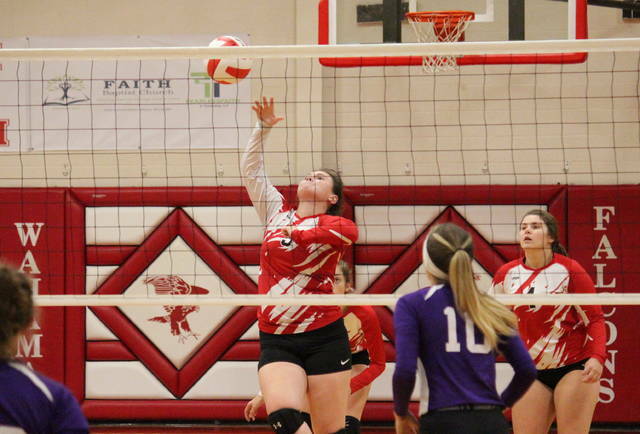 Wahama led 2-0 in the fifth game, but the Lady Wildcats scored 15 of the next 16 to take the match. The Lady Falcons had a 37.5 side-out percentage in the setback. Roush led Wahama with 11 points, followed by VanMeter with eight and Mick with six. Billups, Eades and VanMatre each had three points, while Gibbs marked two. After visiting South Gallia for their third match in as many days, the Lady Falcons have three days off before visiting Belpre on Monday.